Well, after a few niggling repairs and updates to some airframes after the previous PSSA meet on the Orme (A10 wing dowel, U2 hole punctured in fus, spinner came off the Hurri, repair to Mustang wing where Shona knelt on it! ), I'm back to building new aircraft. The Tiffie is coming along nicely as she is really close to paint now, with the cockpit being fitted out and pilot in her seat. 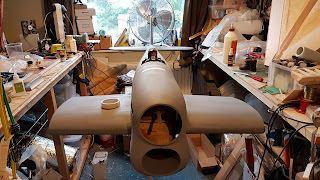 I've got a big lump of lead to cast for the spinner, then I can make some final adjustments, fit the cockpit, mask up and go to paint. Not sure she'll be done for October's meet though, as the Antonov needs a few little bits and I want to take her too. Will see!